Mesothelioma is normally not a cancer one hears about in the childhood cancer community. That may be because, in most cases, because of the long latency period, it is not normally detected until the child becomes an adult. 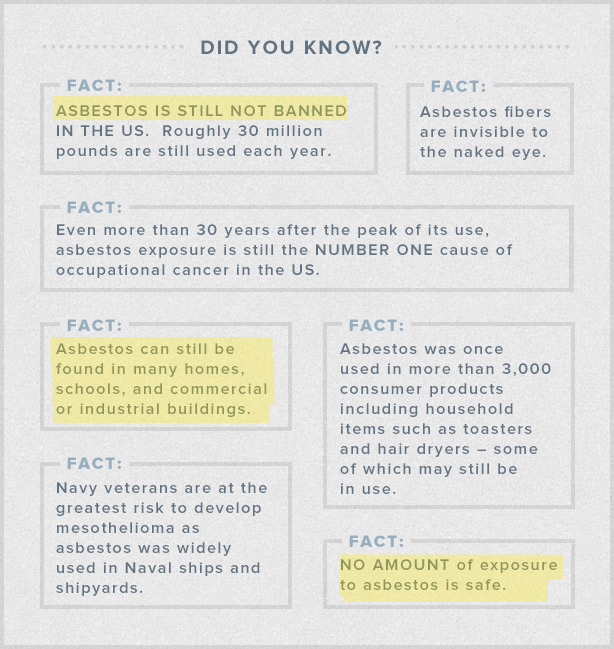 Today, children in older schools may be exposed to asbestos which causes this type of cancer. Notice the fact sheet below. If your child attends an older school, you should be aware of information that should be made available to you. Older schools that contain asbestos need to have a management plan on record detailing how the asbestos is going to be contained or removed and a plan for taking care of any problems arising from any building damage, repairs, remodeling or new construction. Parents have a right to examine these plans. If you have any concerns about your school, contact the school administrator. This entry was posted in Cancer, Childhood Cancer, Pediatric Cancer, Rare Disease, Uncategorized and tagged asbestos, Emily Walsh, Joe Baber, mesothelioma, Mesothelioma Cancer Alliance, old schools. Bookmark the permalink.